The Rebel Sweetheart. 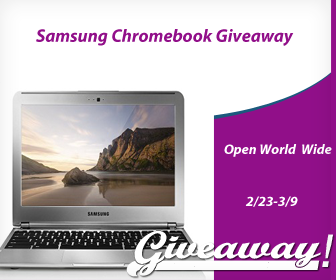 : Win a Samsung Chromebook! Open Worldwide! I love Samsung, oh yes I do. Hence, another Samsung giveaway! This time, we're raffling out (drumroll, please) a brand new Chromebook! The Samsung Chromebook is a new computer that helps you get everyday things done faster and easier. It starts in seconds, has virus protection built-in, and runs your favorite Google apps plus thousands more. The Chromebook comes with leading Google products, like Search, Gmail, YouTube and Hangouts, so you can work, play, and do whatever you want, right out of the box. You can easily share it with multiple people- switching accounts takes seconds, and everyone gets their own files, apps and settings. And it's simple to use. There's no setup, and your files are automatically backed up in the cloud. At just 2.4 pounds, 0.7 inches thin, and with over 6.5 hours of battery life, the Samsung Chromebook can go anywhere you go. It's built to stay cool, so it doesn't need a fan and runs silently. It also includes 100GB of free Google Drive storage (for 2 years), a built-in webcam, and dual band Wi-Fi to make it easy to connect to wireless networks. Now here's the best part. One lucky winner will have the chance to own this gizmo! to be sent via Paypal or as Amazon GC. This event will run from February 23 until March 9, 2013. Enter the giveaway using the Rafflecopter below! Hi, Im Jemimah and I want to win this awesome samsung chromebook because im broke, i quit school, i ran away from home, im despised and accused by my relatives and both of my parents have different families. lol anyways, drama aside.. this free laptop could give me a chance to express myself. i dreamed to own a laptop, a decent camera so i can blog whatever there is i can say to the world. this is the only thing i can ask for. Hi Im Jemimah and I would like to win this laptop because, im broke, i quit school, i ran away from home, im despised and accused by my parents and both of my parents have their own families. lol anyways, drama aside.. I want this awesome laptop because i think this would give me the chance share the world what i think and feel. i dreamed to have my own laptop, a decent camera and be a blogger. this is the only thing i can ask for. i just started a business and it would be great to have a separate computer for it!